Tied House and Trade Practice Changes: Opening Pandora's Box? A very important deadline recently came and went, a deadline that may soon have a major impact on the craft beer industry and I wonder how many that will be potentially impacted were aware. Proposed changes to legislation regarding tied houses and trade practices, by the Liquor Control and Licensing Branch (LCLB), here in British Columbia, have been presented and the deadline for feedback about the proposed changes was February 15, 2011. In June of 2010, legislation was passed here in BC paving the way for amendments to the Liquor Control and Licensing Act in regards to trade practice laws and tied houses. Basically, the government is looking to deregulate the liquor industry in regards to tied houses and trade practices and this scares the Hell out of me! In January of this year, the LCLB issued a Consultation Paper, posting it on its website and apparently sending it to a "number of liquor related organizations" outlining the three different options for proposed changes in both areas, asking for feedback. The purpose of the paper was so that the LCLB could hear from those who may be impacted by the changes, consider all arguments, for each option outlined, so they could make an informed decision about how to shape and draft the new legislation before presenting it to the Ministry of Public Safety and Solicitor General. For those who aren't familiar with the terms tied houses and trade practices, and I have to admit, I really wasn't up to speed until very recently, let me try to explain. According to the LCLB Consultation Paper a "tied house is an establishment that has an association, financial or otherwise, with a liquor manufacturer or its agent that is likely to lead to its products being favoured." In other words tied houses are pubs and restaurants that are linked directly to the producers of the alcohol, who would profit directly from the sale of their alcohol to the public and who could restrict the sale of products produced by their competitors. Examples of a "tied houses" would be Molson House and Heineken House, which were given special exemptions to exist during the 2010 Winter Olympics. Trade practices laws are those that restrict and prohibit "commercial interactions between liquor suppliers and licensed establishments including restrictions on promoting specific manufacturers and their products in exchange for benefits provided by the supplier" (LCLB Consulation Paper, p.2).These trade practice restrictions and prohibitions help stop producers of alcohol from basically bribing licensed establishments by offering freebies to them in exchange for exclusive or preferred sales deals. You have to look no further than Rogers Arena and BC Place where the larger breweries have secured exclusive deals by offering financial inducements. Now I have purposely oversimplified these concepts as they are complex, convoluted and quite frankly, I have trouble wrapping my wee brain around them completely, especially if I am drinking and blogging (no 0.5 % alcohol limit to content with here!). Tied houses have been outlawed in British Columbia since the 1950s when the Liquor Act was changed to prohibit tied houses and the offering of inducements by liquor producers and distributors to licensees. The changes to the law were originally brought in the protect the consumer and smaller breweries as the larger breweries were buying up pubs and featuring only their products, freezing out the smaller breweries and limiting consumer choices. These laws and regulations attempted to stop those breweries with deep pockets, such as Molson and Labatt from basically cornering the market by controlling what the pubs sold, often at low prices to induce overconsumption. In the 1950s there were far fewer pubs and clubs, approximately 600 according to the LCLB Consultation Paper, and no licensed restaurants in the province, therefore it was much easier to consolidate and dominate the market. Today, the LDLB states there are more than 9000 licensed establishments, therefore it is much more difficult to dominate. Over the years, some of these laws have been tweaked to allow for establishments like brewpubs and wineries to sell their products at the same sight they are produced. As well, the trade practice regulations have been relaxed so that liquor producers can supply licensees, for free, with such things as umbrellas, t-shirts, coasters, glassware, etc with their logos on them. The proposed changes will further relax, or completely eliminate these restrictions and prohibitions, depending on what option they pass into law. It has taken years in this province to loosen the grip the major breweries had on the beer market to allow smaller craft breweries to survive and thrive. Despite the laws, the practice of inducements has been alive and well, with breweries having deeper pockets offering kickbacks, i.e. a free keg for every ten kegs (or less) purchased, or offering to pay for improvements to a pub or restaurant in exchange for an "exclusive" or "preferred" sales deal. I have seen this first hand when working in the industry. Local breweries have fought tooth and nail to carve out their place in the market and it took until the past few years for them to gain a a small share of the market even with all these restrictions is place. In the BC Liquor Distribution Branch (BCLDB) December 2010 Quarterly Report, it was reported that breweries that produced less than 150,000 hectolitres of beer had an increase of 7.65% in draft sales and 40.12% in bottled sales compared to the same quarter last year while breweries with production of more than 150,000 had a drop in sales by 7.71% for draft and 8.6% for bottled beers. To me, this indicates that more and more people are being turned on to craft beer here in BC. Despite the fact that craft beer is more expensive, it is gaining in popularity and slowly gaining a larger market share. But if my math is correct - there is more than a good chance it isn't...please see drinking and blogging comment above - despite the reported gains in the BCLDB Quarterly Report, the breweries with less than 150,000 hectolitres still only had approximately 13% of the BC market. The proposed changes, as I mentioned, have been presented in three options. For tied houses the options are: complete deregulation; permit tied houses but limit the number of tied houses that a person/company can hold; permit tied houses with "public interest restrictions" such as rules that the LCLB would enforce and if breeched by a tied house, their license to be a tied house would be revoked. In relation to trade practices the options are: complete deregulation, anything goes; reduce of eliminate "most" trade practice restrictions; allow sponsorship agreements between licensees and liquor producers, but not allowing complete exclusivity deals to be made. These are simplifications of the proposal and for a more detailed explanation, please see the Consultation Paper by clicking the link above. So why the Hell am I rattling on about this, you may be asking yourselves? Well, I am somewhat suspicious about why the government is looking to deregulate and wondering just how such huge proposed changes to the liquor laws have gone basically unreported and unnoticed, even by those who will be impacted. I believe that consumer advocacy groups like CAMRA BC, the press and bloggers like myself have a duty to critically look at these types of changes and question whether they really are in the favour of the consumer and whether they promote the growth of the local craft beer industry. If we get the word out there, make informed decisions about the issues and make our voices heard loud and clear, we can effect positive change. How often do changes to liquor laws, in this province of over regulation, go unreported? Hardly ever. Who is lobbying for these changes and why? Is it that the big breweries are getting slightly nervous that their complete stranglehold on the beer market has been reduced to just a half-Nelson? The LCLB is claiming that they allocate a "significant" amount of their resources to investigating cases of tied houses and the breaching of trade practice laws and enforcing the existing laws and they claim these resources could be better allocated to protect the "public safety" by monitoring over-serving alcohol, over-crowding licensed establishments and serving alcohol to minors. In my opinion, we are already over-protected and we have too many liquor inspectors running around giving out seemingly arbitrary fines and warnings to establishments, enforcing liquor laws that are ancient and out of date such as the "audience participation" regulations and the ever contentious issue of how much alcohol are you allowed to drink when out for a meal in a restaurant. When I look at these proposals, especially in regards to the LCLB's rationalization for them, it again has me really wondering what they are trying to accomplish and why. The first proposal in each area could open Pandora's Box and allow, once again, the deep-pocketed, national breweries to squeeze out their smaller competition by buying up chains of pubs and restaurants and exclusively selling their products. It might sound like I am Chicken Little running around screaming, "the sky is falling" but think about what the market was like just 25 years ago! And think about all the progress the craft beer trade has made and look at what a small percentage of the actual beer market they have. In my opinion, we need to fight hard against anything that allows tied houses just to limit the possibility of the bigger breweries throwing their financial weight around more than they already are. They are greedy coproations with a seemingly endless hunger for more money with no regard for the consumer. It happened in the UK and it can happen here. The practice did not completely eradicate the smaller, local breweries there, but it did reduce their ability to survive in some cases, limited greatly their ability to sell their product unless they sold a controlling interest to the larger breweries. And it did greatly limit the consumers choices in regards to what they could drink and where. Do we want to even allow for that possibility to happen here? I would think if you are a craft beer lover and wish existing local breweries thrive and see more local breweries come into existence, you would want more regulations put on in place to encourage the local craft beer scene not the hinder it. The second option in both areas again would allow for the ownership of a limited number of tied houses and allow sponsorship deals to exist again and opens the door for the larger breweries to impose their financial might to buy a bigger share of the market. What is a logical number of tied houses to allow? How will this be enforced as many larger breweries own a number of smaller breweries and there could be room for manipulation and abuse of the regulations by companies setting up complicated and convoluted ownership schemes. This option, along with the third, will require that the LCLB still allocate significant amount of resources to ensure that the laws are being followed. Does this not contradict directly their rationalization for changing and deregulating? Now, I know that in some cases the tied house rules have hurt the craft beer and wine industry here in BC. A prime example is Lighthouse Brewery when the owner of brewery was not allowed to sell his beer to a restaurant he co-owned with three others due to the tied house rules. Would it not make more sense to look at these case-by-case to see what the relationship is and the intent of the relationship. Surely a local brewery wanting to sell its own beer in a restaurant that has ties to the brewery is not some plot to squeeze out competition and limit consumers in their choices. If any of this strikes a cord with you and you have any concerns about the proposed tied house changes, please let your voices be heard. If you are not already a member of CAMRA, you should join and help consolidate our voice. This is exactly why groups such as CAMRA BC are meant to exist. Let's actively campaign to fight off the big national breweries and promote and support our local craft breweries so that they can thrive. Let's stop politicians from passing laws that could potentially send us back towards the Dark Age of Beer here in BC when you only had to order "a pint"...didn't matter what you ordered because it all tasted the same. Let's campaign to be given the chance to drink the beers we want, where we want and how we want them to be served. I recently received a request from CAMRA YVR, along with all other BC beer blog writers, to give my thoughts about sessional beer. I have to admit I have never really given this topic much thought and don't know if I will add much to the discussion CAMRA YVR is attempting to generate. First off, I do not have any preference for what a sessional beer should be or not be. For me, what I drink is dictated by my mood, my palate at the time, who I am with and my budget. When the circumstances are right, I seem be be able to handle and metabolize several pints of high-octane, big beers and wake up the next day feeling like a million dollars. At other times, I feel the buzz after one or two lagers and it goes all Pete Tong in a hurry. The trick, which I have not quite yet mastered, is to recognize the appropriate times to take advantage of the former and run like Hell when I detect the latter. I can honestly say I have utilized everything from Old Rasputin and barley wines to lower gravity beers like Guinness and lagers as a sessional beers. If I am in for the long haul, and if I have the choice, I tend to change it up as I go. Lately, I have been a major hop monster, so I usually have a pint of Red Racer IPA or Driftwood Fat Tug in front of me to start and then I will venture forth. Red Racer ESB is also one of my favourite starter beers as it is very flavourful but does not blow my taste buds apart right off the hop (no pun intended). I tend to lean towards the bigger beers these days, but not exclusively so and if the mood strikes, I have been known to sit down and enjoy a fare-few Pyramid Apricot Ales. The gravity of the beer has no relevance in my choosing it, or not, as a sessional beer. I have grown so accustomed to drinking 7% beers that they seem the norm now. In fact, I rarely look at the alcohol percentage of a beer until after I have ordered and tasted it. I drink what I like in the moment. I would never choose to drink a beer because it is 4% just so I can drink more. For me, that is like choosing low-fat cheese so I can eat more with less calories. When I was living in the UK, there was really no choice but to drink low gravity beers, at least where I was living, but I enjoyed many of them. But if similar beers were available here, I would not choose them if I were sitting down for a few just based on the lesser percentage of alcohol. I also never choose a high alcohol beer, just based on the percentage, if I am sitting down just for one. If there is something that drives my choice of beer when I am having more than a few, it me is the carbonation level of the beer. I tend to look for beers a little less carbonated after a few as I tend to feel bloated. I have learned a wee trick from my good friend Martin Williams of decanting my beer from one glass to another to get rid of the excess and unneeded carbonation and to slightly warm the beer to release to flavours. It is difficult to choose a beer based on carbonation levels here in Vancouver as most beers are served far too carbonated (and too cold). So, as I said, I might not be the right person to ask about a sessional beer because all beers are potentially sessional beers for me. My drinking habits are not the norm and I realize that. What I find to be the most important factor these days as to what beers I drink and how many of them I consume is the fact that I have a seven-month-old daughter who dictates, more often than not, my beer drinking habits. In fact, said seven-month old is currently squirming in my lap like she has just been tazered, with a funky smell coming from her diaper...she not only is the most improtant factor in my sessional drinking habits, but she also dictates when I can write about beer and for how long. 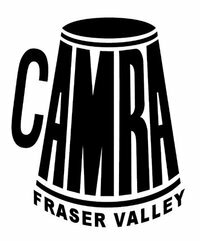 For those of you who haven't heard, CAMRA BC has quietly expanded to the Fraser Valley. On January 27th, with little fanfare, CAMRA Fraser Valley was founded, bringing CAMRA BC's chapter count up to four. The Fraser Valley branch joins existing branches Victoria, Vancouver and Penticton, giving CAMRA BC and even stronger voice here in Southern British Columbia. CAMRA Fraser Valley is headed by branch president Micheal Victory who reported, as of Feb 02/11, to VanEast Beer Blog (VEBB) that they currently have approximately 30 members. "We will be building on an already growing craft beer scene here in the Valley. 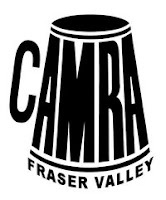 With the likes of Firefly (Fine Wines and Ales), Kingfishers (Waterfront Bar and Grill) and Mission Springs(Brew Pub) we are optimistic about Camra Fraser Valley - even in the short term," President Victory informed VEBB via email. "We'll likely have a member's appreciation event in the spring, and then something larger in the summer." The branch is still in the beginning stages of setting up its social networking sites and website but there is some contact information available to those interested in joining the branch or gathering information. Their website is currently under construction but you can currently access email contact links. You can also find them on Facebook and Twitter @CAMRA_FraserVal. Say No to Exclusive Beer Agreements!! Recently I popped into one of the restaurants on Commercial Drive that features craft beer to speak to one of the managers about some business. During the course of our conversation, we started to talk about the lack of local representation amongst the restaurant's numerous taps, with both myself and the manager wondering aloud why this was. The manager mentioned that he had wanted to get one of the Lower Mainland's most well-known and popular craft beers on tap, as it was one of his personal favorites, but was informed he could not because another restaurant on the Drive had "an exclusive" deal to be the only establishment to carry said beer on Commercial Drive. Now stop me if I am wrong, but doesn't this go against the whole movement to make craft beer more readily available to a wider cross-section of people in our fair city? While groups like CAMRA, individual advocates and bloggers like myself are doing our best to promote local craft beer in order, at least in part, so that we can convince as many places to offer local craft beer to their patrons, therefore increasing the sales for local breweries , it seems some of these breweries are limiting their options by giving "exclusive" deals. I can understand, from a business point of view, a restaurant or bar, if they really wanted to sell a certain brand of beer, making a deal with the brewery to only carry their beers, but this was not the case here. The establishment with the "exclusive" also sells beers from other craft breweries. From a consumer point of view and as a lover of this particular beer, this disturbs me. I would love to be able to walk into any establishment in the city and be able to quaff the beers I love. I hope this notion of "exclusive rights" does not become a trend and spread as it will set back the craft beer movement and force people to possibly go to establishments they don't want to frequent, to get the beer they crave and love. In the end, this move could backfire on the breweries making these deals as people may just be forced to chose beer from their competion. Isn't the idea to sell beer, not restrict sales? If a respected and dedicated craft taphouse wants to sell a certain brand of beer, you would think that brewery would be happy to have their beers sold there. In a perfect world every pub and restaurant would be a "free house" dedicated to bringing the best craft beer products they could get their hands on, especially local products, serving these beers in the proper manner and with the respect they deserve. Let's keep fighting to open up the market, promote our favourite beers and advocate and campaign to get them in as many bars, restaurants and liquors stores as we possibly can. I know this can work from personal experiencing, having harrassed my local government liquor store to bring in a product until they get tired of me and relent. I have also, in the past, connected bar/restaurant owners with local brewers I know to try to get some of my favourite craft beers on tap in bars and restaurants that I frequent and in some cases, it has worked (lets you know how much $$s I spend on beers in these places!). Vancouver has come a long way over the past few years in regards to places where you can get great, local craft beers but lets keep pushing forward because there is still a lot of room for improvement. Let's encourage our local breweries to spread the love and work with us to promote craft beers not create "exclusive" places we must go to get their products. Late last year a group called BeerTourist popped out of nowhere to begin promoting beer tourism by chartering buses and going on road trips to sample great crafts beers afar. 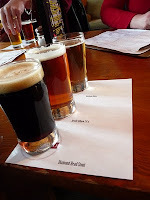 They organized two trips, one to Washington State to visit Skagit Brewery, Rockfish Grill/Anecortes Brewery and Boundary Bay Brewery and the other north, to Howe Sound Brewery for a daqy of beer and fun. Both trips were successful and for the most part, with one or two exceptions, BeerTourist recieved great feedback. I have it on good authourity (I am one of the founders and organizers) that BeerTourist is busy organizing for the upcoming year. No dates are set in stone, as of yet, but stay tuned for details. BeerTourist is going to try to shake it up a little this year and organize a number of different type of events. I can tell you that one of the events currently in the planning stages involves a ferry ride and a visit to a brewery that is producing some of the best beers around at the moment! BeerTourist is curently working on their website but can be found on Facebook, Twitter @vanbeertourist or you can contact them directly at info@beertourist.ca.